Have a Happy Crafty Halloween! I have been dying to share the costume I created for my son this year. Sewing all the vinyl stars was totally worth it. My favorite features are the cape, the cuffs and the walking cane (he's a senior Evel). Hey, I figured he wouldn't dare wear a helmet so I had to accessorize somehow. Let's ride! Looks like we made it - literally! We've completed the Costume Craft-Along for this Cupcake Fairy mashup. And the little fairy approved of the final look shown here. 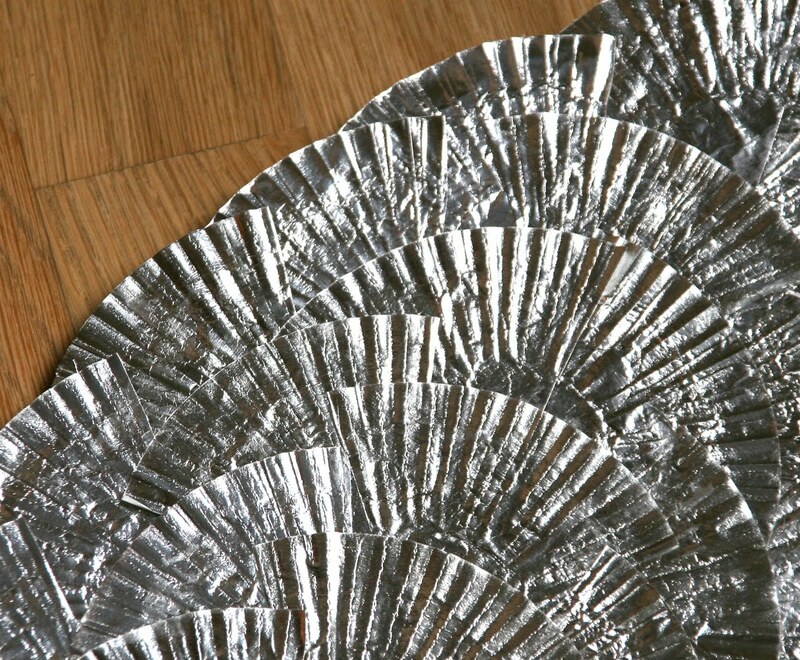 For the wings, I wanted to utilize the silver cupcake papers (found at most grocery stores, craft stores, or baking supply shops). We cut each paper into 4 pieces, then loosely flattened them out. One at a time we glued the wedges onto a piece of cardboard that was cut into the shape of wings. I recommend starting from the outside edges and working your way in. This is a great craft to do with kids! The wings are attached with 2 elastic loops that wrap around her shoulders. 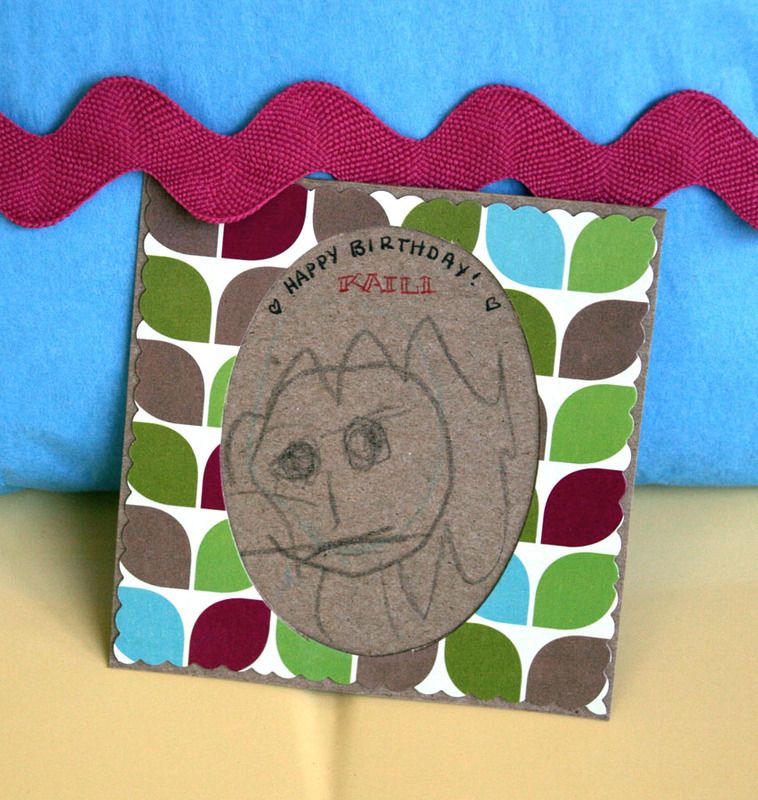 We also added a crease down the middle back simply by folding the cardboard to give it more flexibility. 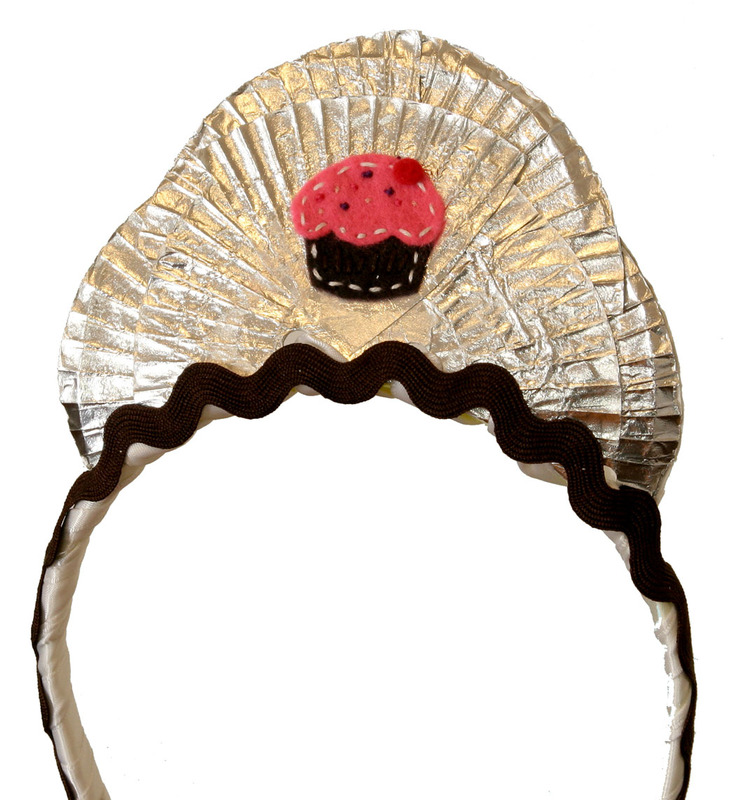 The same cupcake paper technique was used to make the tiara. We started with a cardboard base which I attached to a store-bought headband and wrapped with satin ribbon and trimmed with brown rick-rack. I love this mini felt appliqué we added to the tiara. It's the same design as the felt appliqué on the apron, just smaller and without the face details. 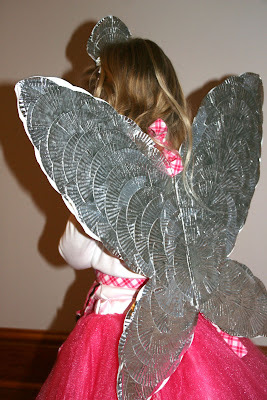 And the fairy wings & tiara made with silver cupcake papers complete the look. 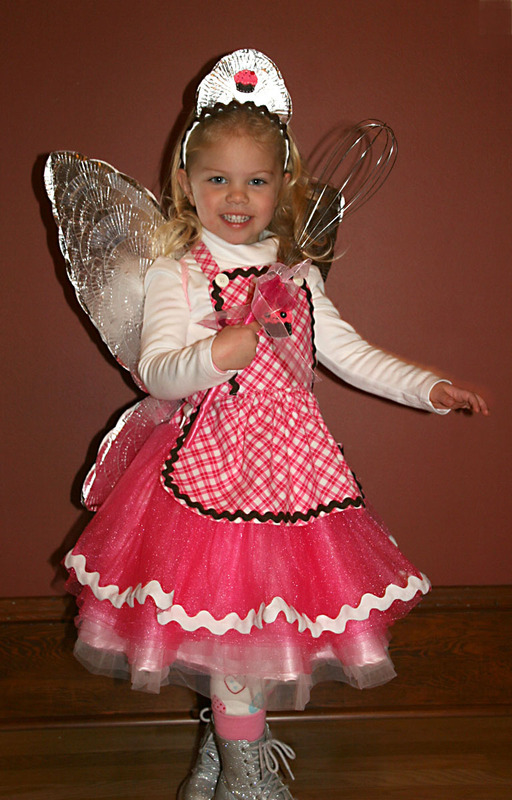 Hope you had fun crafting this Cupcake Fairy Costume with me this Halloween! Send pics if your handmade creations too! Now we're really cookin'! Our Cupcake Fairy costume is sewn and now the final accessories are being crafted. 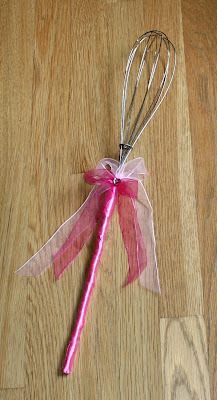 The whisk wand is not only clever, but one of the easiest pieces to make. You probably already have an extra whisk in the back of your kitchen drawer. Otherwise they're cheap and easy to find at most grocery stores. I started with a plastic tube (from a previously broken wand), wrapped sturdy masking tape around the whisk handle and tube to join them. Then I wrapped pink satin ribbon from the base of the whisk down to the bottom of the tube. Secure the end of the ribbon with a dab of glue or do a simple whipstitch to finish it. To top it off, I added a sparkly gem and ribbon. Now if this whisk wand could magically clean my kitchen I'd be set. Keep following along with me on this Costume Craft-Along. 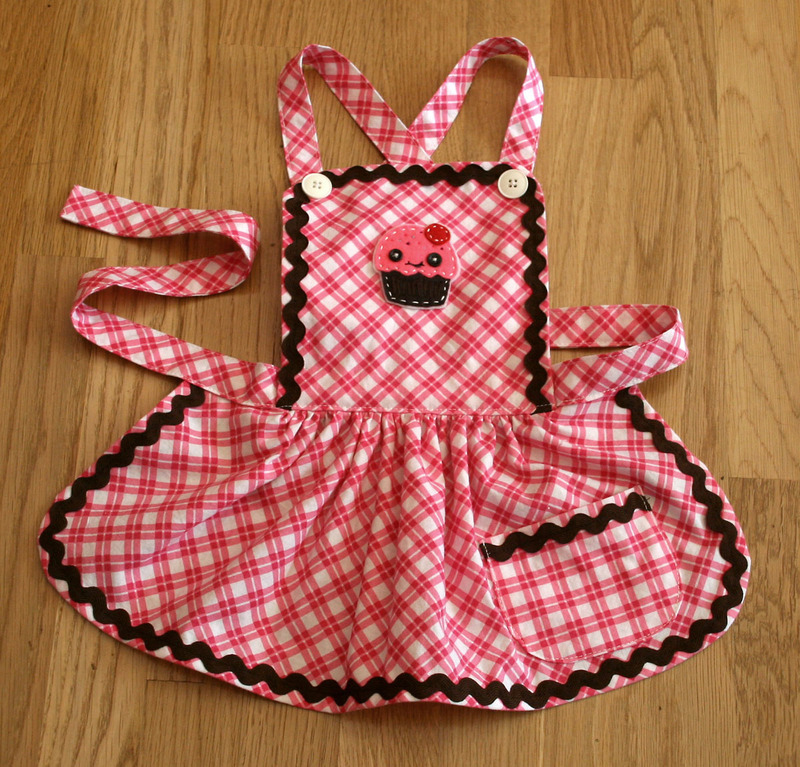 The Cupcake Fairy Apron turned out as sweet as buttercream frosting. I used a pink plaid cotton fabric and cut 2 rectangles - 1 for the skirt and 1 for the bib. The skirt panel was gathered, then attached to the bib portion. Brown rick-rack was used to trim the edges, including the small pocket on the skirt. I made 1 long rectangular strap for the waist tie and two smaller ones for the shoulder straps, which cross in back. Don't bother with making button holes for the buttons on the bib, just sew through all layers and use a snap on the back of straps where they meet the waistband. Quick tip - be sure to measure the length of the apron skirt based on the length of the tulle skirt. 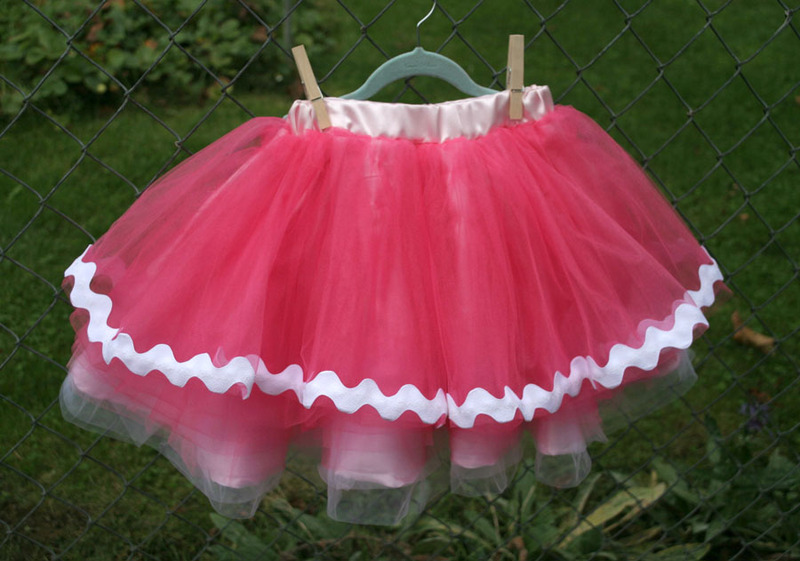 You want to make sure that the tulle skirt rick-rack details are visible! 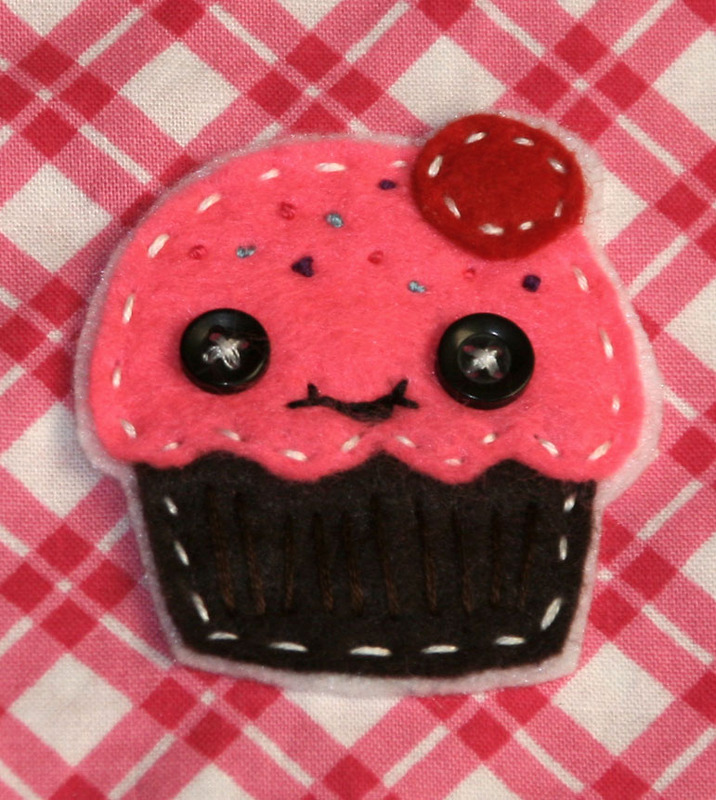 I wanted to drive home the "Cupcake Fairy" theme by adding this cute felt cupcake appliqué. 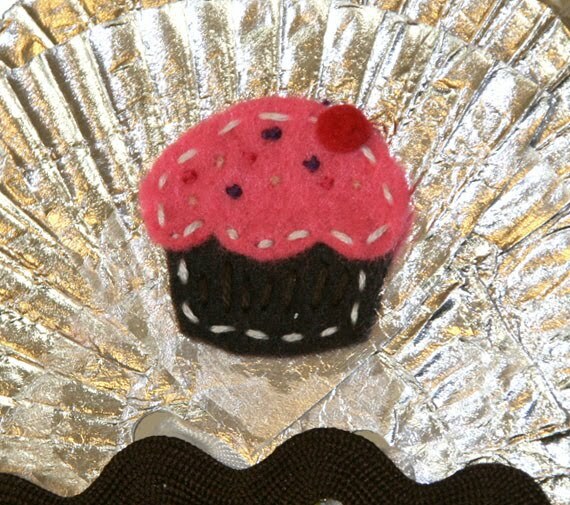 I cut the 3 pieces (cupcake, frosting & cherry), then glued them to a white piece of felt. Next, I embroidered the stitching details and added the button eyes. Don't forget the sprinkles! We should be wrapping up this Craft-Along by the end of this week so that you have plenty of time before the holiday parties begin! Hello Fall! Hello wet, runny-noses! Hello cold and flu season! I found myself buying the 12-pack of tissues at the store yesterday and it's only October. Luckily there are a variety of bright, modern prints to choose from these days. Used facial tissue is not something to craft with, but the colorful printed cardboard boxes lend themselves to a plethora of projects. Here I cut apart a small square box of tissues, using the top panel and one of the printed side panels. Don't forget to tear away the plastic sheet from the opening. My daughter lent her artistic abilities for a custom birthday card for her cousin. I finished the side edges of the top panel with my scalloping shears to make it more decorative. 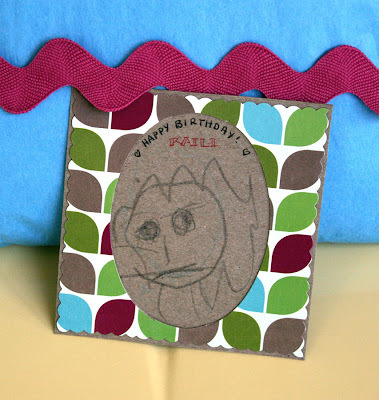 Sandwich the 2 panels together with glue and you've got a cool, recycled craft perfect for cards or photo frames! Step 1 complete: A Cupcake Fairy skirt with layers of puffy tulle and rick-rack icing trim. 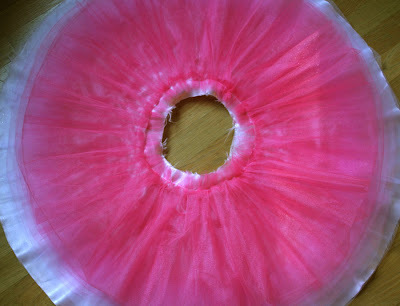 If you're new to sewing with tulle I have some advice - this is not the time to try it, go straight to Target and buy a pre-made tutu. 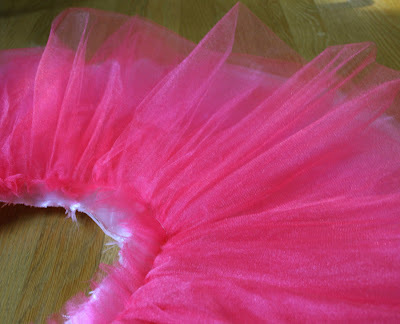 I layered in a few tones of pink tulle and it took me quite some time to complete this skirt. But I'm crazy about the oversized rick-rack trim and "twirl" factor. I started by making a simple circle skirt out of a satin lining fabric. I based the size according to the final length of the skirt and my daughter's waist measurements. I used a total of 8 yards of tulle in 3 different shades and gathered them in rows from the hem up to the waistband. I cut strips of the tulle then folded them in half lengthwise to create a softer edge and add more volume. As you can see, the skirt gets a bit puffy. For the waistband, I made a casing for the elastic and sewed to to the top edge of the skirt, hiding all of the frayed edges and tulle madness. The satin skirt lining was finished using a basic rolled hem. The oversized rick-rack was sewn directly to the edge of the top layer of tulle. Hope you're having as much fun as I am! Remember last Fall's posting "Back-to-Cool" custom label project? Those work well with jackets and heavyweight outerwear. 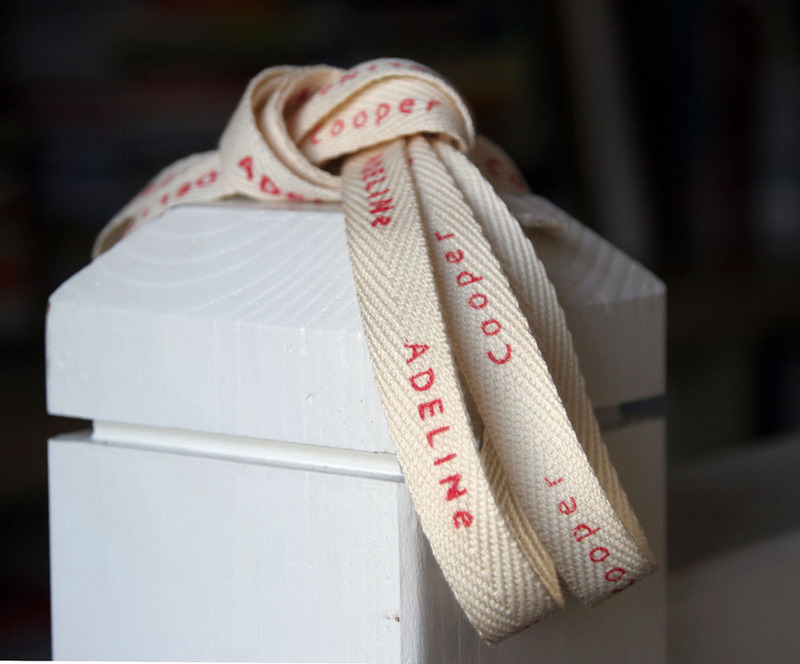 This follow-up project is primarily for those interior labels that can get scratchy or stiff. Plus - no computer software or printer required! Simply pick up some alphabet stamps at your local craft store and twill tape (I went with the 1/2" width). For the ink, try the VersaCraft stamp pad that is specifically for fabric. Don't forget to heat-set your labels before the first wash! When you're ready to attach the labels to the garments, fold under the raw edges of the twill tape and do a simple whip-stitch on either end. When you're ready to pass on the outgrown garments, it's easy to remove the stitches. What do you do with ever-increasing vintage button collection? Make jewelry like this gorgeous ring I made during a craft workshop at Collage here in Portland. Layering the buttons made the possibilities endless. Be sure you use the correct glue and let it set completely before you model your wares!